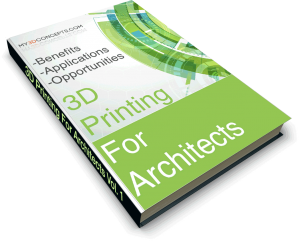 3D Printing Benefits for Architects. All Things Considerd. The architectural industry is a highly competitive industry. For every project, architects are facing relentless competition. Clients have a vast variety of choices, which drive architectural firms to seek performance and innovation. Thus providing an incentive that would make them stand out and be chosen, is the key to winning a project. As a result, using high tech to describe their practice, many start to turn for help towards Additive Manufacturing (AM). The 3D printing benefits for architects and the competitive advantage that it offers within the design processes are gaining more and more popularity. Today architects use 3D printing mainly as a tool for conceptual models and show models to motivate prospective clients and investors. It is an excellent complementary tool for rendering images and computer models. Communicating the idea – giving a depth, dimension, and texture to a project – it’s an excellent way to stand out from the other firms. The process of making a model by hand is a long and tedious process of the past. Whether is conceptual to test the design (1-2 weeks) or a final version (2 -3 months), building a model manually using cardboard, wood or foam, creates a long timeline. That is, in turn, leads to reasonably significant investment for a single model. In contrast, 3D printing cuts the timeline significantly allowing for the designers to have in just a few hours an architectural model with a high level of precision, while decreasing the costs up to 75%. Furthermore, a 3D printer can operate non-stop overnight for the larger and more complex models, which take longer to print. The technology adds great value by increasing the productivity. One of the 3D printing benefits for architects is to test quickly many concepts and iterations in the early stages of the project. Thus to recognize swiftly different potential issues, which would be a lot harder to identify on computer simulations. 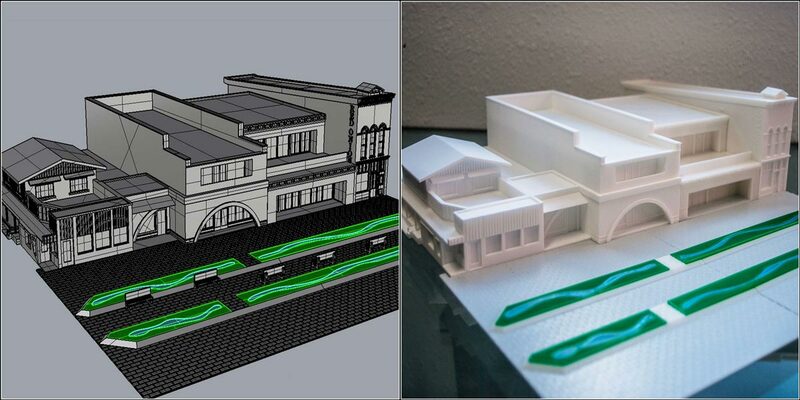 Moreover, designers can print low-cost architectural models overnight at different stages of the project. Used as study models, with various designs and scales, to asses space, volumes, and general structure. In a short-term and at a no great cost – one can print new, changed, redesign and improved design based on the previous models and corrections. Making many iterations of the model helps determine how the design influences its surroundings. Looking on a bigger scale, one can examine how the massing of the model fits in the massing of the city. Going a size bigger – how it influences the massing of the neighborhood. Zooming more and more – the plasticity or the massing of the building itself. 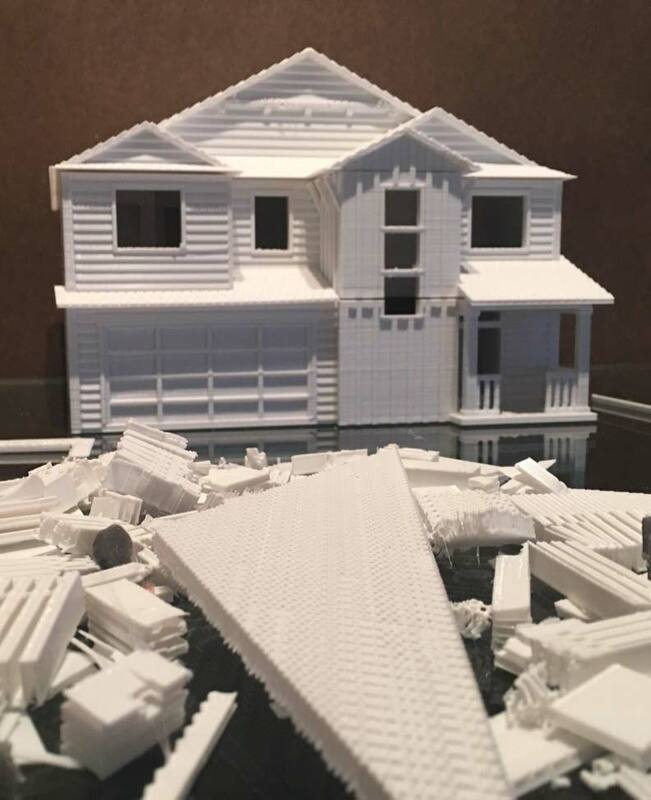 With physical 3D printed model, the communication between the architect and the clients is evident. Therefore the understanding of the concept – immediate. For instance, when you have a meeting with your clients, put a scale model in one corner of the room and load photorealistic renderings in the other. You know where the most of their attention will go. Right? The only things needed are the proper 3D file, compatible with the 3D printer and the material requirements and the machine will do the rest. Since you already work in 3D environment, there are only a few additional steps to prepare a model for 3D Printing. – The 3DP parts are suitable for further post-processing. Depending on the desired results and the material used there are various techniques to improve the look and feel of a model. – Assembling the models in case of multiple parts or modules designs. – In-house 3DP requires operating and maintaining the machines. Things like generating G-code, loading materials, removing support structures, cleaning the fresh out of the printer parts, calibrating etc. 3D printing allows for shapes and forms of high complexity to be created at no extra cost. Intricate and elaborate designs are created straight out of the printer. Shapes that would be close to impossible or extremely hard to recreate with any other tool. With additive manufacturing, any structures and shape are possible as long as the design meets the machine specifications with the chosen material requirements. When a design is final, and a 3D printable file is obtained, you can make as many exact copies as you wish. This feature is not only handy but also uncommon, considering the conventional ways of making models. Now you can gift each of your investors and clients a scale model copy of the project they hired you for. No extensive knowledge of fabrication or model making is required. Familiarity with the design guidelines and 3D software is all you need to get started. Children in elementary schools have begun to create their own figures using 3D printing processes. This technology is the most direct way to manufacturing and with only a few lessons anyone can have the basics skill to 3D print! Moreover, 3D printing allows for multiple realistic and detail copies at any stage of the project to be printed. Use an as show models – to better communicate and motivate clients and investors. 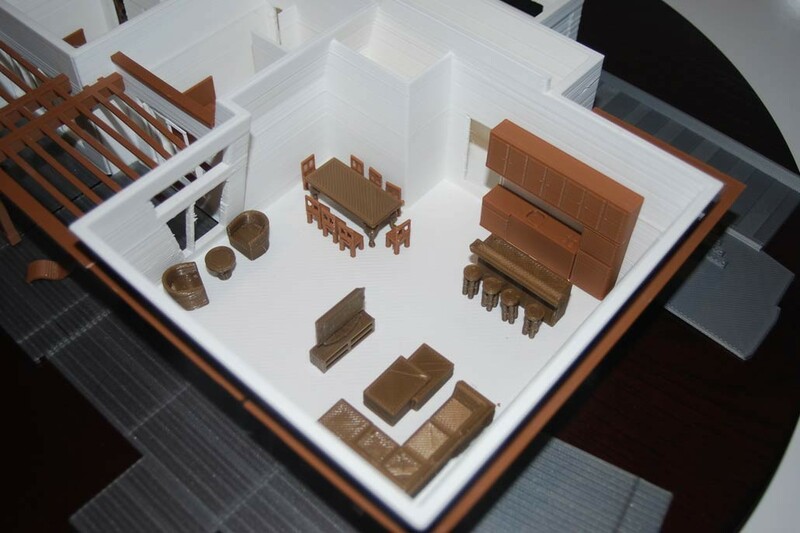 Going into a meeting with an exact model of the building that is going to be built, is a great visualization tool. Also, an effective way to make a lasting impression. The technology allows for external as well as internal exceptional detail visualization. Also, it can produce robust and accurate presentation model with texture and railings. Basic or complex, one or many – 3D printing saves time, costs and eliminates to a great extent the waste using up to 90% of the raw material all while providing high-quality fine featured models. and third, that allow for the waste material to be reused. Models are produced faster, easier and cheaper at any time during the design process. Any new changes made in the design are adapted and printed efficiently/simultaneously. Update your models in short notice and at no great cost, make changes and corrections on the fly based on the previous designs. BIM compatibility. An easy and efficient path form BIM to 3D Print, however, for best results we recommend a third-party software to be implemented in the process. Also, some 3rd party plugins may ease the process of generating 3DP ready files. 3D Printed Conceptional Scale Model on a Desktop 3D Printer. The model includes exterior and interior information about the project. All things considered, 3D printing is going through the same process of development as computer drawing. Some people genuinely believe that this is the future and others who don’t see the use for it. The technology combines the precision of computer simulation and the tangibility of a scale model. Computer drawing evolved from hand drawing to photorealistic renderings. Similarly, just as nowadays you can not go to a client with a hand drawing, there will be a point in time where clients will no longer accept any model that does not have the detail level and visualization qualities that 3D printing provides. 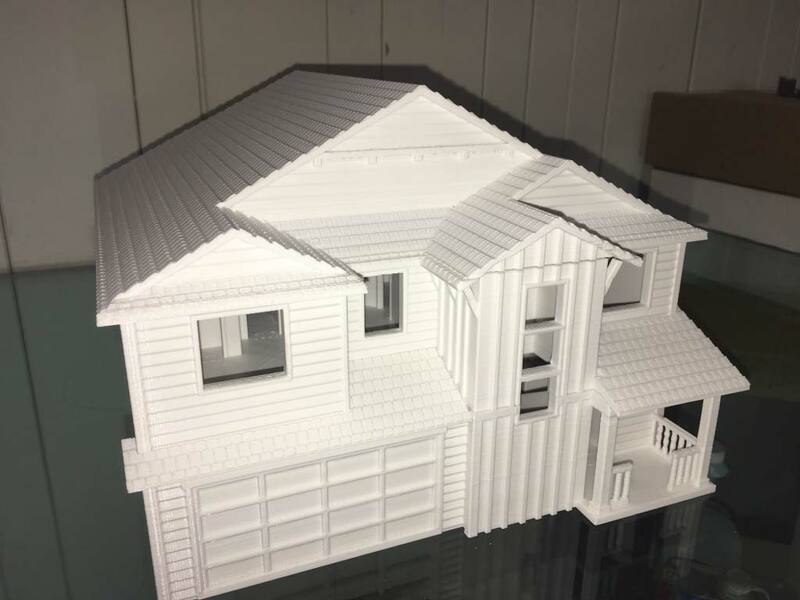 The core 3D printing benefits for the architects are that it saves time and money while increasing the value to the clients. Consequently, the driver for that progression will not be the architect, but the client and what he wants. And thanks to the flexibility of 3D printing, what the client wants is what the client gets! That’s a great article. I’m currently researching how to implement 3D printing into my design workflow. Thank you for the read! I never thought of 3d printing as something that would be beneficial for an architect. This is because I didn’t realize that the technology has advanced so much as to be able to build a scale model of a home. This is something to remember because knowing how far 3d printing has come could open up a lot of opportunities for people that would be otherwise very expensive. I like how you said that architectural design is being used in models to help motivate clients and other people like that. Having an ability to show what you want to do before you do it would be helpful. That way the client can get an idea of what you have in mind and how it will look in the end. Thank you for the comment, Todd. Yes, that’s right. Scale models have been around since the beginning of architecture and yet on-screen visualizations like renderings and animations can’t do all the job explaining a project in depth. 3DP technologies are ushering the comeback of scale models period!